Details beyond that are slim, though we’re told that this is an effort in which Jobs had been involved with in the months prior to his death. 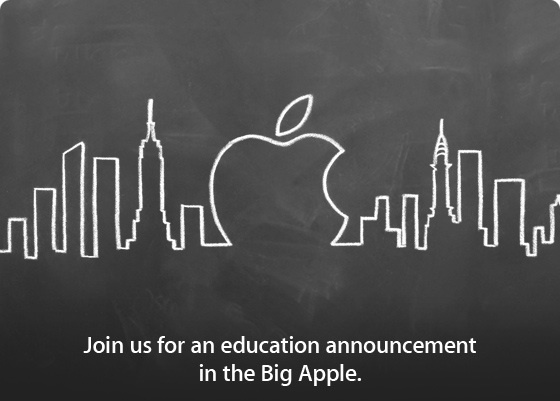 That could mean that it’s the textbooks-on-iPads plan that Jobs famously discussed with biographer Walter Isaacson. Fox’s Clayton Morris is hearing something similar. The textbook market is certainly ripe for digital disruption, but the players that have emerged so far are pumping in a lot of cash with little to show for it. Currently, no major textbook publishers are partnered with Apple’s iBooks in any significant way. iTunes U offers a wide variety of free college level video courses from top universities, including Stanford University’s popular Developing Apps for iOS 5, and iPhone Programming courses. It is not expected for the upcoming event to include any new hardware announcements, although the iPad 3 is anticipated for launch as soon as this March. Presumably these text books will be offered on the iBooks platform for iOS.